Her predecessor presided over roundups and the sale of horses for slaughter. Without equine or ranching experience, what will this former executive do to right the wrongs? 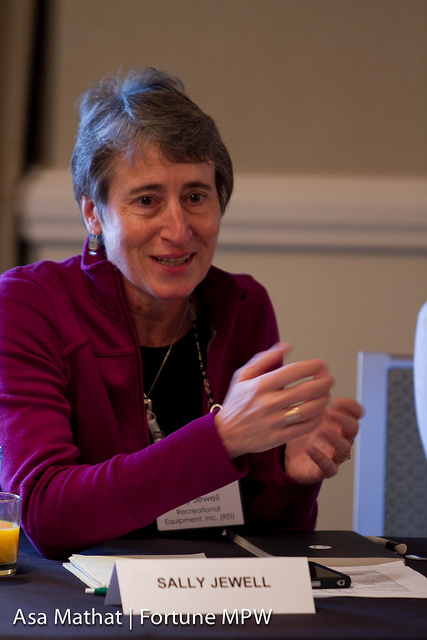 On Thursday on Capitol Hill, the Senate Energy and Natural Resources Committee will hold a confirmation hearing to consider the nomination of Sally Jewell for the position of Secretary of the Interior. She comes to the room offering some measure of comfort to two of the primary constituencies that care most about the post. Big oil? Check — she worked for years for Mobil Oil, out in the oil and gas fields of Oklahoma. Environmentalists? Check — she comes to Washington, D.C., from R.E.I., the “outdoor recreation” company, where she was a longtime advocate for conservation. But Jewell is mostly a blank slate when it comes to two key areas of the Interior Department’s portfolio which are in famous and direct conflict with one another. The first relates to the federal government’s complicated relationship with the ranching and livestock industries. Jewell does not appear to have much of a public record when it comes to her views on the concept of welfare ranching — the age-old, under-reported pork-barrel policy by which the federal government practically gives away the use of our public land to private ranching and farming interests by means of well-below-market lease rates. The second unknown area of Jewell’s resume involves the fate of nation’s wild horses, which roam public lands and which have suffered greatly over the past few years as a result of the ruinous policies of Jewell’s would-be predecessor, Ken Salazar. For wild horse advocates, the good news is that Jewell doesn’t come from a longtime ranching family, as Salazar did, or have a long record of hostility to the nation’s herds, as he does. The bad news is that Jewell may today know so little about the legal status of the horses, and so little about the political and economic background of their current predicament. that she may not be able to quickly focus on their situation. And that, these advocates fear, could be catastrophic to the herds. Despite Jewell’s background with Mobil, she will likely be tagged on Thursday by Republicans for being too much of an conservationist. And despite her history of work on conservation causes, she may be tagged by Democrats for her career in oil — and also for her benefactor’s disappointing record of conservation during his first term in the White House. In either instance, the topic of wild horses isn’t likely to be raised at all. The ranching and livestock lobby certainly doesn’t want to bring attention to their recent success in ridding the range lands of the horses. And the horse lobby isn’t now strong enough to force a senator, a committee — or Congress as a whole — to yet raise a ruckus. With all this in mind, here are the seven horse-related issues Jewell should have to address before she is confirmed for the post. The federal government now holds these horses in cramped pens at significant expense to taxpayers. In the meantime, the BLM has allowed known advocates of horse slaughter to buy thousands of these horses. As secretary, are you prepared to stop these harsh roundups, to unequivocally protect wild horses from slaughter, and to impose a zero-tolerance enforcement policy against those individuals who seek to buy them for slaughter as well as against those BLM employees who knowingly sell them to these individuals? If so, how exactly? 3. The long-term solution. We all know that the current situation with the corralled wild horses is unsustainable as an economic or political policy. Approximately 50,000 of them are now so housed, which means that more are currently in pens than roaming free as intended under federal law. Some advocates believe that the horses should be returned to public lands — the tiny fraction of those lands from where they came, where they still would be overwhelmed by the numbers of sheep and cattle which graze there (at below-market lease fees). Other advocates believe the Bureau of Land Management should aggressively pursue birth control methods in the herds to reduce population growth while sustaining the viability of the herds. Many say that if the current situation continues, and if the BLM cannot find habitats where most of these horses can be repatriated, thousands of them will inevitably be euthanized or sold for slaughter. (Indeed, in Oklahoma, where the BLM held a public meeting earlier this week, state officials again want to legalize horse slaughter.) As Secretary of the Interior, how will you solve this long-term problem of what to do with these horses which now are essentially “wards of the state” thanks to Obama Administration policies? Do you support finding new public-land habitats for them? Do you support their repatriation to former grazing areas? 4. Transparency at the Bureau of Land Management. In theory, the Interior Department is supposed to be an honest broker between private and public interests competing for the management and use of public lands. In practice, when it comes to wild horses anyway, the BLM has for generations been little less than an instrument for the business interests it is supposed to regulate. For example, the National Wild Horse and Burro Advisory Board, which is supposed to give the public a meaningful voice in wild horse policy, is stacked with individuals with long ties to livestock and ranching interests. One of these members, in fact the newest “public” member to join the Board, is vocally supportive of horse slaughter. Are you prepared as secretary to ensure that horse advocates, who may be more openly critical of current BLM policies than their counterparts in the ranching and livestock industries, are more invested in the process by which wild horse policies are created? If so, how? Earlier this week, at the Oklahoma meeting, members of the public were given only three minutes each to publicly express their views about the BLM’s wild-horse policies. And under Secretary Salazar (as noted below), the BLM has been consistently unwilling to publicly respond to public comment and criticism about wild horse policy. Will you be willing to ensure more transparency and public participation in this regulatory process? If so, how? 5. Political give-and-take. In southern Wyoming, urged on by BLM officials, a ranching and livestock group, aided by other corporate interests, has sued the federal government to “zero out” most of the wild horses living on a vast 2-million-acre swatch of public and private land that includes several local herd management areas. Now, having encouraged the very lawsuit filed against it, the BLM agrees with the plaintiffs that the horses should be removed from these lands even though there is strong evidence that the existing herds are doing no more damage to these lands than the livestock which outnumber them by many orders of magnitude. Are you prepared, as Secretary of the Interior, to extract from the ranching, livestock, and energy industries explicit promises to protect the herds in exchange for their continued push to extract natural resources (oil, natural gas, etc.) from public lands at below-market costs? In other words, what fair and reasonable price are you going to impose on these industries for ridding public lands of federally protected horses? What are you going to say to these corporate officials when they continue to ask the BLM to remove wild horses from public lands for their own commercial benefit? Are you prepared to call for nationwide market rates for federal leases on public grazing lands? 6. Personal outreach. A lifelong Colorado rancher, your would-be predecessor was singularly unresponsive to public requests from wild horse advocates. He repeatedly refused to meet with them as he authorized the round ups of tens of thousands of horses. Salazar refused even to respond to a petition signed by 25,000 citizens and by 20 members of Congress seeking information about the BLM’s sale of approximately 1,700 wild horses to a known horse slaughter advocate. And last fall he threatened to punch out a reporter who asked him to comment on the sale of these horses. What, specifically, are you going to do to reach out, personally, to wild horse advocates so that you can better educate yourself about the plight of the herds? Are you prepared to meet privately with such advocates on a regular basis — say, four times a year — to ensure they have more direct input into the policies affecting the horses? Given the federal laws and regulations designed to govern the preservation and management of the wild horses, do you see it as part of the core responsibilities of the Interior Secretary to engage in such meetings? 7. Conservation. Opponents of wild horses say that the herds do great damage to public lands and that they draw down precious natural resources. But empirical evidence — and common sense — tell us that the relatively small number of wild horses on public lands do far less damage to the environment than do the relatively large number of cattle and sheep which also graze those lands. In other words, a million sheep and cattle destroy more public grazing lands in America than do a few thousand horses. And the remaining herds live on only a tiny fraction of federal public lands to begin with. As a dedicated conservationist, are you prepared to view the economic conflict over wild horses in those terms and to implement policies which take a broader view of the causes of environmental harm to public lands? In other words, as a conservationist, are you prepared to consider the scientific possibility that cattle and sheep pose a far larger problem to the environment than do wild horses? And, if that’s the case, what specifically do you propose to do about it to save America’s protected wild horses from extinction while better protecting our public lands and better distributing the economic price of such protection? This entry was posted in Uncategorized and tagged Andrew Cohen, Energy and Natural Resources, Mustang, Protect mustangs, Sally Jewell, Secretary of Interior, The Atlantic, wild horses by Protect Mustangs. Bookmark the permalink.